Welcome to the best place for class resources! Elizabethans had some very different ideas about how society and the world works, and understanding their point of view is critical to understanding some of the themes in Macbeth. Check out this quick explanation of Divine Order on Shakespeare Fun Facts page. Click here to go to The College Board's website for AP Exam practice. Click here to download a copy of the podcast analysis sheet. Click here to access a reliable online literary terms dictionary. Click here to watch the video on OP from the New Globe Theatre. Click here​ to check out some classic advertisements from the backs of classic comic books. 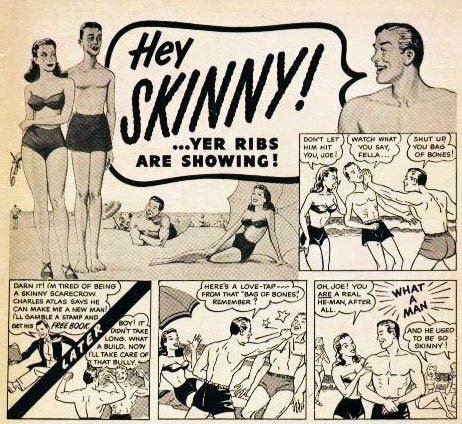 Click here to see a version of the 1950's ad campaign for a body-building program. Click here to listen to Poetry Out Loud's 2014 Michigan Champion recite Cornelius Easy's poem, "The Empty Dance Shoes." Click here to listen to Poetry Out Loud's 2016 Montana winner Caroline Huber recite Louise Erdrish's creepy poem "Windigo." 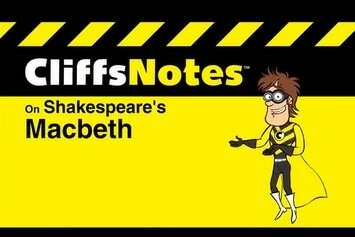 Click here or on the picture of Cliff for Cambio's Cliff's Notes on Romeo and Juliet. I recommend watching it before reading the play, in between each act, and at the conclusion of the reading. 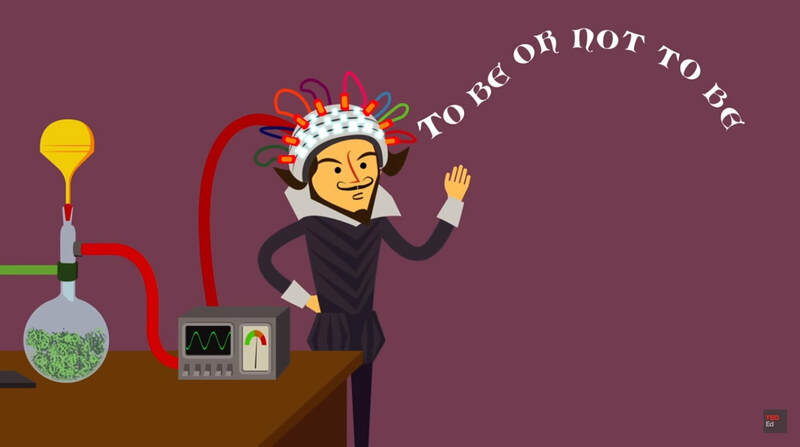 Check out this helpful TedEd video on iambic pentameter. This USA Today story from 2007 details an unusual archaeological find outside of Mantua (yes, that Mantua). ...but do feel free to explore and learn! Click here to access the Literary Terms Dictionary entry for consonance. Click here to link to the BBC's television production of The Tragedy of Julius Caesar. ​Click here to visit membean's treelist. Click here to access the article on Aleppo, Syria. Some of you are missing this assignment! Part of preparing for life is being well read. Part of preparing for college is being well read. Part of learning to what it means to be human is to be well read. Are you sensing a theme yet? Click here ​for 101 great books that you should read to be well read. Click here to view the Slideshare on organization. Click here to access the Othello webquest. Remember to follow the links to your subject and to answer all questions and to cite your sources to avoid plagiarism. ​Click here to view teacher Chandra Martz's tutorial on writing a thesis statement. It's always important to feed your brain. Below are some links to whet your appetite. This summer you will be getting a jump-start on learning by reading a fantastic book and doing some prep work for class. You will be reading Laurie Halse Anderson's book Speak. As you read, you will keep a reading journal and highlight your assigned motif. You can pick up your book in the front lobby of NBHS (your name is already written across the bottom edge of the book). These are yours to keep, so please do mark them up as you read. You can download the instructions for your reading journal by clicking here. PLEASE do not hesitate to call, text, or email me if you have questions or get stuck. It's my job to help you! In addition to the reading journal, you will be asked to highlight one of three motifs we will focus on to write a paper once school begins. Emily, Lillian B., Madeleine, Julia and Halle will highlight all passages dealing with lips/the mouth/speaking. Lillian H., Paige, Adrienne, Katelyn, and Sam will highlight all passages dealing with trees/plants/seeds. Charlie, Greg, Nichole, and Lucy will highlight all passages dealing with mirror/reflections/looking at oneself.